Firstly, the term sushi rice is a misnomer as technically, the word sushi refers to the rice, not the final product. But for arguments sake we’re going to ignore that little tidbit. Sushi would not be sushi without great rice. Anyone can boil rice, but to make really good sushi you will need the right kind of rice, cooked the right way, and properly seasoned. The first thing you need to know is the right kind of rice to use for sushi. The short-grain rice reserved for the task is often called sushi rice, and is available now in many markets, not just Japanese markets. Only this kind of rice has the right balance of starches (amylose and amylopectin) to allow the rice to stick together and keep the final product intact from plate to mouth. Try to eat medium or long-grain rice with chopsticks and you will understand what I mean. It is best to use the instructions on the package of rice when cooking it, but a general suggestion is to use equal parts rice and water. 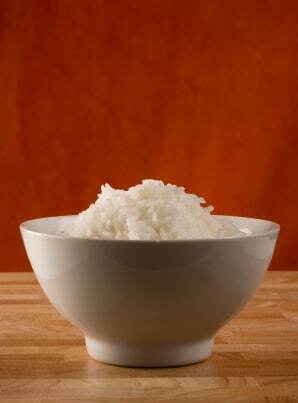 Prior to cooking, the rice should be rinsed in cold water until the water runs clear, a step now becoming less necessary as talc (used to prevent the rice from absorbing water and sticking together during storage) is slowly being replaced with another type of starch, which is fine to cook with. But you never know and the package won’t tell you what the company used as a coating. A rice cooker will do a fine job, however if you do not have one you can use our fail safe pot rice recipe which has served many well in the past. You should have the seasoning for the rice prepared ahead of time. When the rice is cooked but still hot, place it in a large stainless steel bowl (which is best, but you can certainly use any non-reactive bowl at your disposal). To prepare the seasoning mix 5 tablespoons of rice wine vinegar (it must be rice wine vinegar), 2 teaspoons of sugar, and 1/2 teaspoon of salt together and stir until the sugar dissolves. Heating the vinegar will make the sugar dissolve faster, however the seasoning should not be used until it has cooled to a comfortable temperature (room temperature is best). This will season approximately four cups of cooked rice and can be extrapolated to make more depending on how much rice you are preparing. Remember that one cup of uncooked rice will yield approximately two cups of cooked rice. Mix this seasoning sparingly into the rice using a cutting and folding motion as to avoid crushing the rice and making a paste. You want to keep the grains as intact as possible. You may not want to use all the seasoning you have prepared, so it is best to taste along the way until the rice reaches your desired seasoning level. You will realize what that level is the more you make sushi at home and season your own rice. The rice should be alternately folded and fanned to cool it to room temperature. Warm rice does not good sushi make… Some people spread the cooked rice out on a cookie sheet or aluminum foil to cool, but if you do this be careful as aluminum and vinegar do not mix well a this is a very reactive metal and does not like acidic foods. I would suggest a baking pan or cookie sheet if you wish to hasten the cooling process in this manner. When the rice has cooled it is best to take a moist paper towel or hand towel and drape it over the rice when you are not using it to prevent the top layer from drying out and getting hard. You now have your seasoned sushi rice ready! You can make this hours before you start making sushi at home, as long as you keep the damp towel over the top of the rice to maintain it’s moisture level. For those looking for a simple method without a lot of effort, our recipe section includes Gavins’ Fail-Safe sushi Rice, which should result in decent sushi rice without a lot of mess and work. It may not be as perfect as the result above, but it’s faster and easier, great for those looking for a quick and easy solution. N.B. In some grocery stores you can buy kits that have all the equipment, seasonings, etc. that you will need, but they are not always of the highest quality ingredients and sometimes you can actually save money by buying individual ingredients yourself as many of them you will be using for other foodstuffs as well. That is not to say they are all junk, but caveat emptor (buyer beware). They may be a good way to start, but don’t feel bound to one.